Gus: We've had lots of rain and flooding here. We thought everyone could use a little sunshine. Gus: I bet you are all singing "doo doo doo doo" right about now! 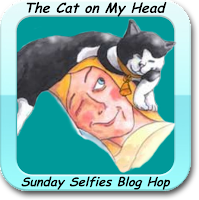 We are joining our friends at The Cat on My Head for their weekly Sunday Selfies Blog Hop. Please hop on over to see the other entries. You are all just SO precious. I hope the sun comes out and stays out just for you! Awesome selfies! And dare I say these Fab 4 have way better haircuts than the other "Beatles" MOL were singing Ol' man river more often than not these days and love to be able to sing here comes the sun!! You are all so much cuter than the original Beatles. Not only do we have to listen to the mom squee'ing...now we have an earworm!